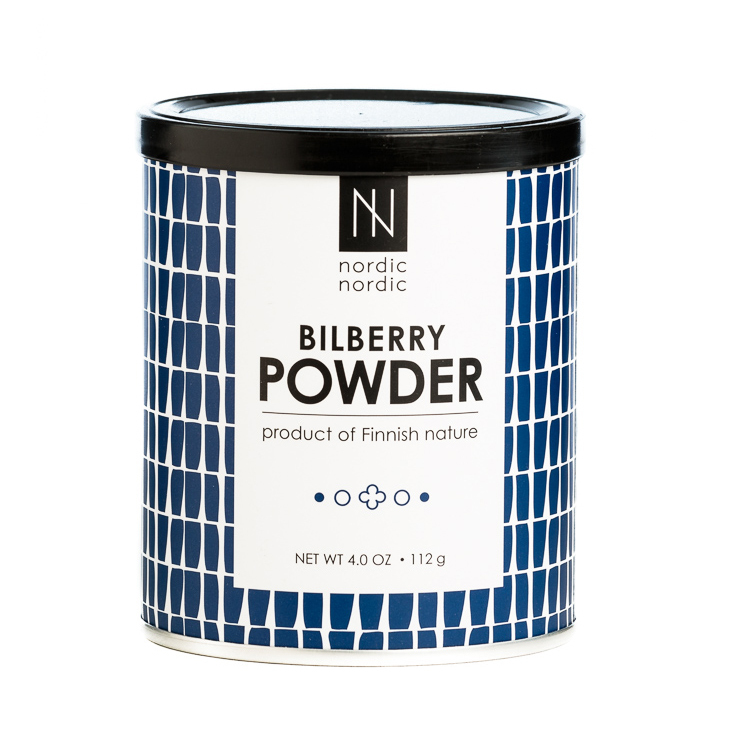 More about NordicNordic Bilberry Powder Bilberries are a Finnish superfood with taste similar to that of the blueberry but with three times the anthocyanin compounds. 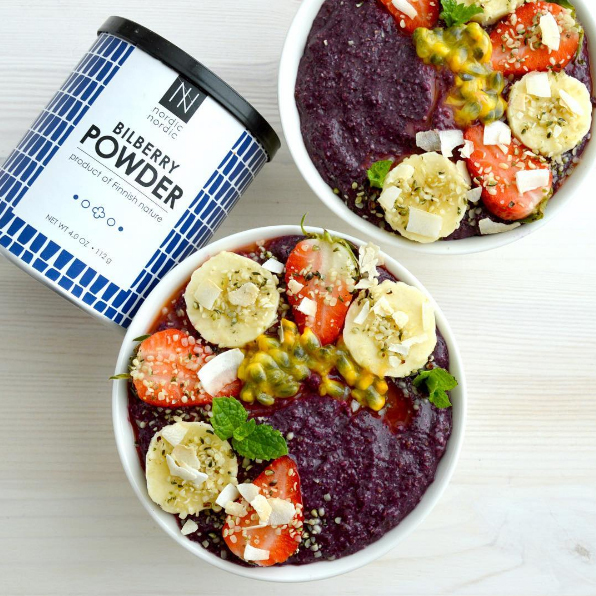 Here, it's health benefits are retained and dehydrated in the form of a powder with no additives, food color or preservatives - - meaning it is Vegan, Kosher, Paleo, Raw and non-GMO. It contains vitamins A, C, E and K and is a great source of fiber. 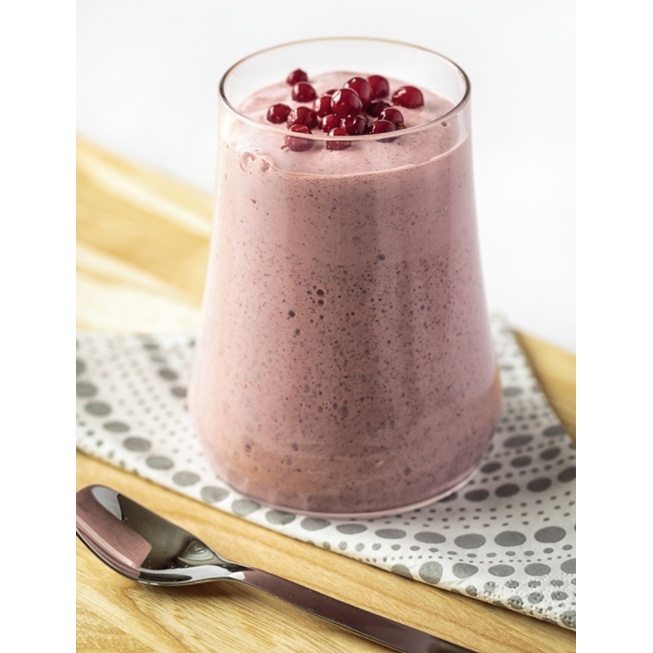 Bilberries have been shown to protect tissue, assist in digest, and improve vision, circulation, skin appearance and brain health. 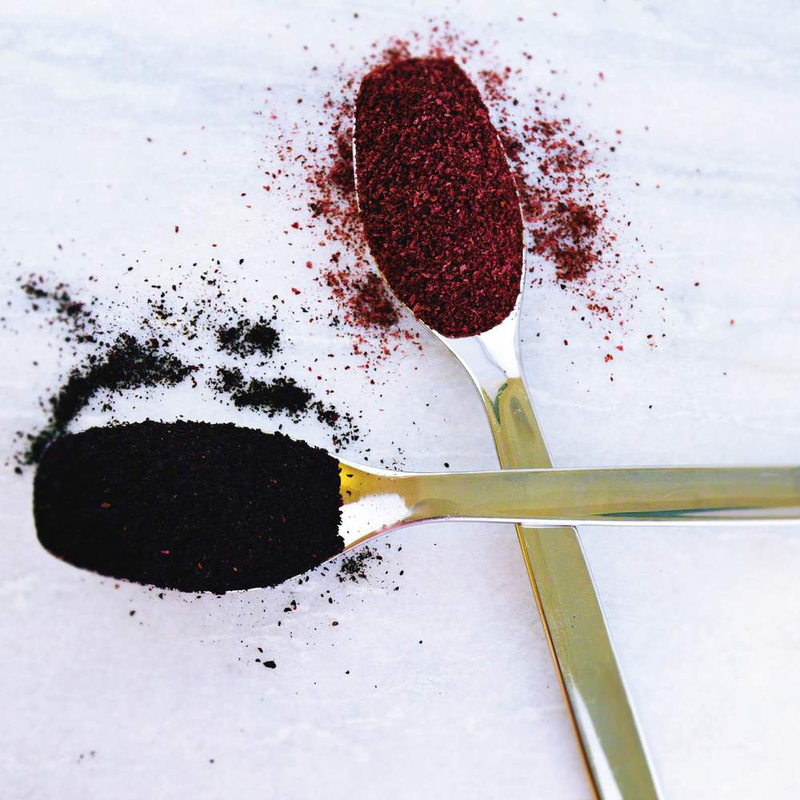 A tablespoon a day is equivalent to 300 berries, each hand-picked in the forests of Finland with the seeds and flesh included. 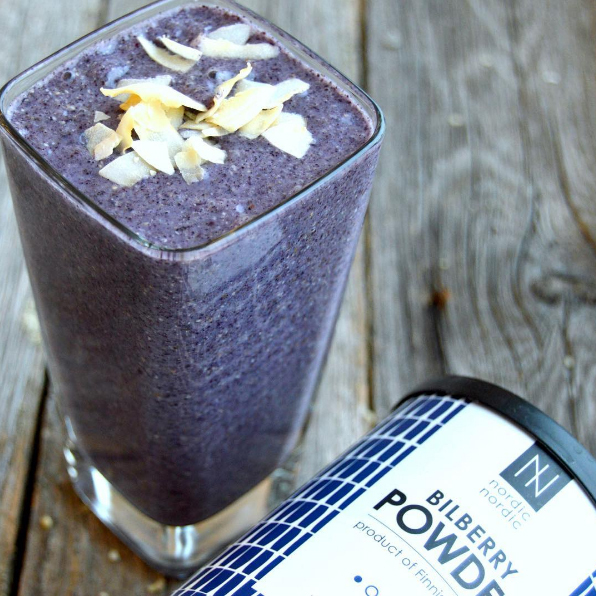 NordicNordic Bilberry Powder can be mixed with many foods and drinks such as smoothies, tea, yogurt, oatmeal, granola, or ice cream. It can also be incorporated in baking and cooking for healthier meals and desserts. Click here to see what you can make with this Bilberry Powder and other NordicNordic products! 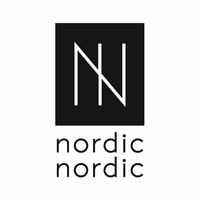 NordicNordic Bilberry Green Smoothie from NordicNordic on Vimeo. 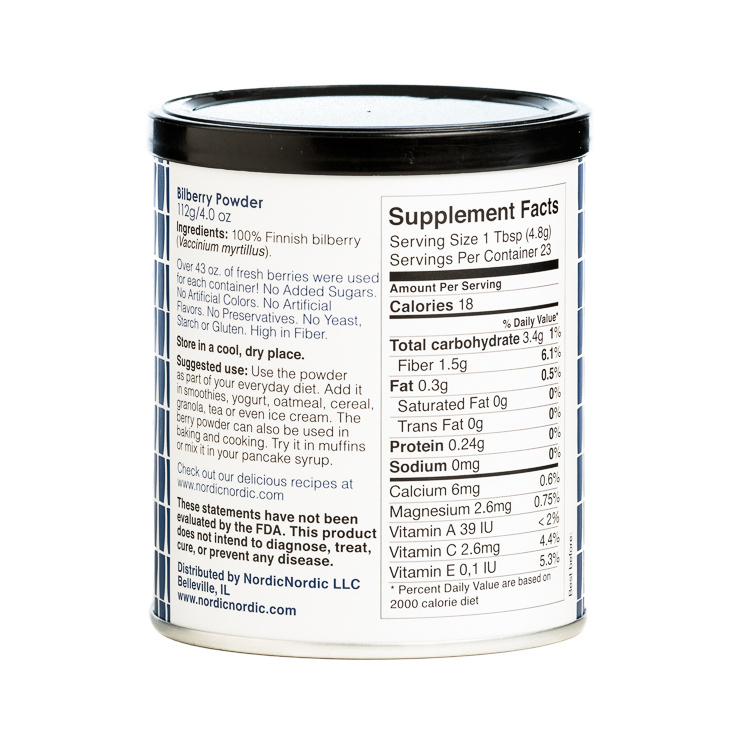 23 (1 tbsp) servings per container. I haven't tried this yet as it was a gift, but the recipient is on a low-sugar diet and was very happy with the purity and the lack of any added sugar. I decided to give it a try. I havenâ€™t tried it with yogurt or in a smoothie yet. I just add a large teaspoon of it to a large glass of water. The powder doesnâ€™t dissolve completely, but it drinkable this way and not too tart. When you open the top and unseal the container you can literally smell the potency of fresh bilberries! I use a tablespoon with plain yogurt. Will continue to order. Very high quality product. Very satisfied with product and company service. Great way to supplement one's diet with fibre and flavour! I happily ate loads of bilberries in Finland and I know how good they are for eye health. Back here, I can't get the berries but being able to add the powder to my daily yogurt assures me I'm doing well for my eyes! Plus it tastes great! Is this a concentrate, a standardized extract, or "just" the dehydrated berries (not standardized or concentrated)? This is just dehydrated berries. No preservatives, no added sugar, etc. 100% bilberry. Is this an organic product? Thank you! They are raw, vegan, vegetarian, paleo, gluten free, dairy free, non-gmo and organic.